ABOVE: An evening view of St. Moritz Bad (left) and Dorf (right), with the frozen lake between. St. Moritz (or San Murezzan to the Romansh-speaking natives) has been an international resort for as long as anyone can remember. In the Middle Ages, it was known for the healing powers of its mineral springs; later, toward the end of the 19th Century, it became a sunny winter refuge for bedrizzled English aristocrats. The sporting life has been a part of St. Moritz since the first British visitors staged toboggan races on the steep village streets a hundred years ago. Two Winter Olympic games have taken place here (in 1928 and 1948), and today's winter sports include alpine and cross-country skiing, figure skating, hockey, curling, bobsledding, skeleton tobogganing on the Cresta Run, ski paragliding, a golf tournament on the frozen lake, polo, greyhound racing, and horse racing. St. Moritz Dorf, the main village, is built on hills that rise from the northern side of Lej San Murezzan. This is where you'll find most of the grand hotels, upscale shops, remnants of Engadine architecture, and urban amenities. The railroad station is at the base of the hill, and both the bobsled run and the Cresta Run plunge toward neighboring Celerina from the east end of the village. St. Moritz Bad sprawls in the valley floor at the lake's southwest corner. It's mostly modern, with a scattering of 19th Century buildings amid the apartment blocks and villas. The cross-country ski center, public swimming pool, and ice stadium are located in Bad, making it a practical base for those who rate sports above atmosphere. Although it's possible to rent apartments and villas, the quintessential St. Moritz experience is in the resort's traditional hotels. These range from the Suvretta House, Carlton, Kulm, and Badrutt's Palace at the upper end of the scale to cozy rural inns like the Landgasthof Meierei (an easy walk from town along the lake's northern shore, and a great place for dinner). For guaranteed lowest available rates at scores of hotels, apartments, hostels, and condo hotels, see our hotel partner's pages at Booking.com: St. Moritz. 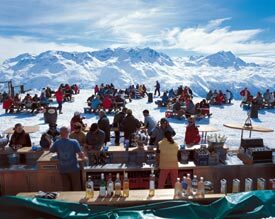 ABOVE: A ski bar on the Corviglia slopes above St. Moritz. St. Moritz is the kind of resort where you're likely to have at least one major meal besides breakfast in your hotel. Still, there are plenty of restaurants to choose from in a variety of price ranges. The most expensive are in Dorf; the middle-class establishments are mostly along the road between Dorf and Bad, where you'll also find supermarkets. For a meal or snack with a view, try Mathis Food Affair's La Marmite at the upper station of the Corviglia funicular. (If your budget is limited, have an afternoon dessert and coffee in the attractive cafeteria while watching skiers zip by outside the windows.) And don't forget Meierei, which I mentioned earlier. It's the perfect spot to enjoy fondue bourguignonne. As for nightlife, there are plenty of clubs in town that range from expensive to out of sight. If money is a concern and you love the apr�s-ski life, Club Med's all-inclusive resorts (Roi Soleil and Reine Victoria) are worth considering. Finally, the town has an Engadiner Museum that's worth visiting if you're even remotely interested in the Engadine region's history, life, and culture. If you're a cross-country skier, you'll be delighted by the 150 km (100 miles) of groomed XC trails in the area. You can ski from one village to the next, returning over a different trail, by bus, or on one of the many local trains. Equipment rentals are available at the cross-country ski center in St. Moritz Bad, where you can also get expert waxing for a small fee. 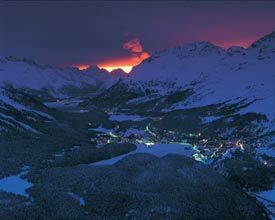 From Z�rich Airport, St. Moritz is about four hours by railroad. You'll need to change trains at Z�rich Hauptbahhof (the main station) and again at Chur, where you transfer to a narrow-gauge Rhaetian Railway line. You can also drive to St. Moritz, but the roads can be tricky in winter and you may need tire chains. 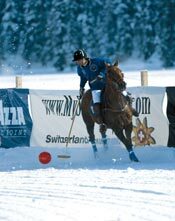 LEFT: In Winter, polo tournaments take place on the frozen lake of St. Moritz. It started out as a simple elevator ride--and turned into a public event that starred two parents, a baby, and the St. Moritz rescue squad. Switzerland's fourth language, based on "the people's Latin," is spoken by only 48,000 people--but they live in some of the country's most famous resorts, including St. Moritz. The official site of the St. Moritz Tourist Board is packed with useful advice.